'Hens don't play' muttered my friend, the one who saves her kitchen scraps for me in her freezer. She calls it 'chook cook'. She is my egg quality controller, too - more grit! More greens! I fear she might be right about the playful poultry aspect as well. 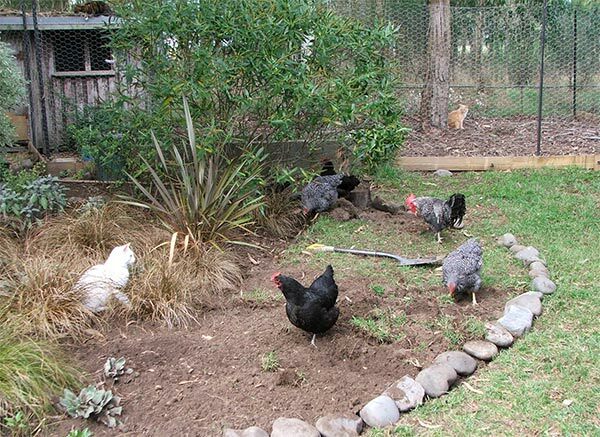 Henworld, the silliest of gardens, started life in the silliest of ways. I was gifted a trailer load of used bricks. What to do with them? That garden design warning buzzed in my brain - always use materials natural to your landscape. I use lots of free, smoothed river stones, in path edging and surfaces. 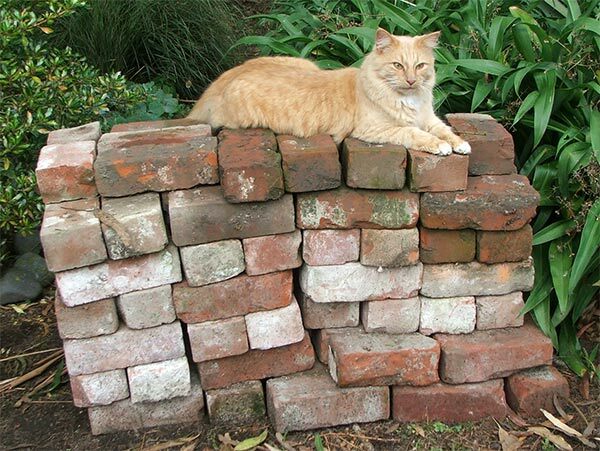 Free bricks - what to do with them? Non-Gardening partner overheard me twittering on about a wagon wheel herb garden by the Hen House, so he duly dumped the bricks nearby. Oops. One should always make the most of random gardening situations. 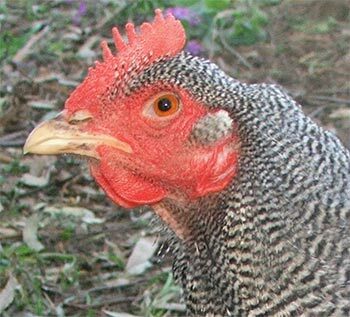 So obviously I decided to create something bricky near the Hen House. But a herb garden, three minutes of serious trekking from the house kitchen? Might not inspire the cook on a rainy day. Then the idea popped up in a random conversation after swimming. I would build a playground for my hens, immediately outside their run. Perfect! And so Henworld was created - easy as laying an egg! First I dug a circle, and then I laid the bricks in the shape of a curving letter 'H' to form little paths. I was sure my hens would enjoy pottering along them. Four brick towers were connected with natural wooden perches - gum tree branches. 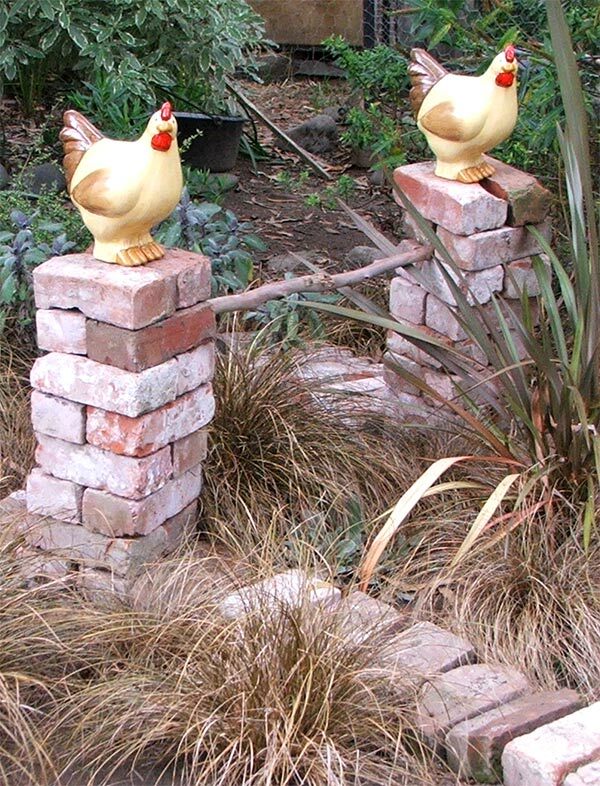 To provide chook ambience, and company, some outdoor lifesize hen statues were artistically placed. My poultry loved it while I was digging. They loved it while I was scratching around in the soil. They scratched around too, finding grass grubs and chortling with delight. Later I cleaned out their henhouse straw and scattered it between the paths. Great excitement! I also collected up handfuls of unsuspecting slaters (woodlice) and cruelly threw them around. Instant success! It's early days, but I suspect that Henworld as it stands isn't quite the attraction I thought it would be. It needs help - a mechanical woman-scarecrow scratcher is one idea I've had. Edible features are also planned, though it's too late this year to plant any chook-vegetables like silver beet. There aren't many Henworlds in the world - well, in the Google-search world, that is! The Moosey Henworld is unique. I wonder why? My friend is right - hens don't really 'play' - yet!